Datu Nestor is the tribal chieftain of the Bendum Tribal Council. 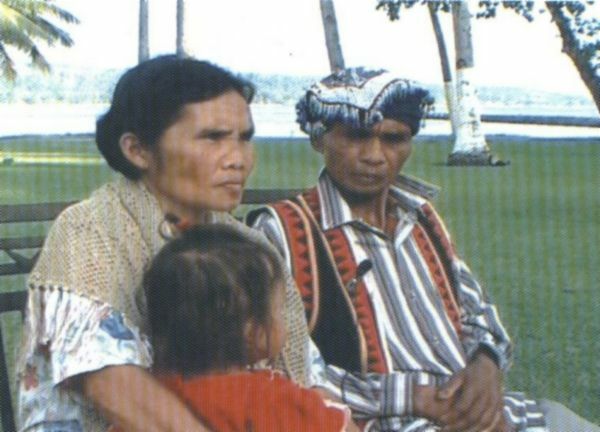 His wife, Nay Bebe, is active in the women’s livelihood committee. What changes have you witnessed in Bendum in the last 20 years? A change that is taking place is the strengthened practice of our culture like the performance of rituals. The conduct of meetings likewise provides an avenue for gathering and coming up with integrated plans. Due to the series of community discussions, there is an increased awareness not to lose our ancestral domain. Another thing is the education of the children. Children have started learning how to read, write and compute. This ensures that they will not be cheated in transacting business. The aspect of community livelihood has changed. We have replicated the dumagat (migrant) system. Though some of us still practice traditional land use, this is very limited because now we have other options. We care more for our water, land, forest and other resources. These resources we do not want to vanish, because in the future it might be that our children may suffer. Another aspect is the discussion among the elders to strengthen our culture for the government to recognize us. The government provides assistance, once we have strengthened ourselves, because the government encourages communities to practice their culture. We applied for a Certificate of Ancestral Domain Claim (CADC) which we got in 1998. The CADC shows the extent of our land on a government map. We conducted community mapping to locate our ritual areas, hunting grounds, and other resource extraction areas in our forest. What have been the changes after the issuance of the CADC? The CADC strengthened our stake over the forest, as the government now recognizes our presence. The government recognizes the claim of our culture over the ancestral domain. We have gained respect for our management of the forest and the trees and we have been encouraged by having a CADC. We have strength to protect our forest from potential exploiters because of the CADC. What helped in the implementation of your plans? The coming together of datus to discuss issues affecting the broader community as well as the presence of an NGO helped in realizing some of the plans. Through community discussions, people came together and in the process, strengthened the culture. Other groups recognized our efforts because it is through community discussions that people develop common goals. The issuance of the CADC as government policy strengthened and affirmed our policies. The CADC is important because it comes from a higher authority. The guidance of the groups who took pity on us, like the NGOs, also helped in realizing some of our plans. What are the difficulties you encountered that make it difficult to implement your plans? Different datus have different wants, they have different views, so there are disagreements. Thus, there are those who do not like to follow the policies, and instead violate them. Community members lack appreciation of the contribution of the ancestral domain because support does not come from government representatives. Sometimes, support from barangay and government officials reaches the community, especially from city government. Our members cannot see it – what is the use of our policies when we cannot get assistance? Our needs are not being addressed. What else do the people of Bendum need to do to achieve the changes they want? The development of our farm production is an aspect we think we need assistance. The farming systems in the community have changed, so we need resources such as carabaos, and seeds such as corn and rice. We have parcels of corn fields and rice fields which are important for us in our livelihood activities. We also need to improve the fertility of the soil, so that it will not continue to be malnourished. No matter how hard we work, if we do not look into the fertility of the soil, we cannot eat. The soil is very red. It will be difficult for us if soil fertility will not be addressed. We need fertilizers, but fertilizers will further destroy the soil. The soil is inherently malnourished. Applying fertilizer for high grade corn production will further lower its fertility. What it needs is fertilizers that will help improve the fertility. What about the women, Nay Bebe? How do the women help the family and the community? We, the women, contribute to the family by helping in planting crops like corn, camote and vegetables. In the family, we ensure that the needs of the family members are taken care of, including children attending school, as well as the overall well-being of our family. By attending meetings in the livelihood group, we gain something. We are encouraged to weave abaca fibers, mats, and other products in order for us to earn. Within 5 to 10 years from now, what do you look forward to happening in Bendum? In our perspective, livelihood and education are very important aspects we look forward to. We cannot send our children to further studies because we cannot afford the expenses. Education is very important in terms of reading and writing. It is important so that children will not be like us who are illiterate. Thus, livelihood is important so that we can afford to educate our children. For you Nay Bebe, in ten years time, what is it that you look forward to happening in Bendum? The children have now been attending school. I hope that they will have further support in continuing their studies. I hope that we can support their needs though I know that it will really be difficult for us, because our livelihood activities are not enough. I would also like to add that we need to develop in terms of our cultural identity with Apu Palamguwan, together with Magbabaya and the Migbaya who watch over us. We are thankful both to Magbabaya and to those groups coming from the outside who helped us.